The writing instruments collection dedicated to Nelson Mandela is elegantly unobtrusive Ducale design, tuning finely to his quiet but enormous personal spell. It comprises a fountain, rollerball and a ballpoint pen, all made in delicate Ivory resin reminiscent of Robben island’s quarry landscape. Nelson Mandela was imprisoned on Robben Island for 18 out of 27 total years, he served behind bars, before the fall of apartheid. 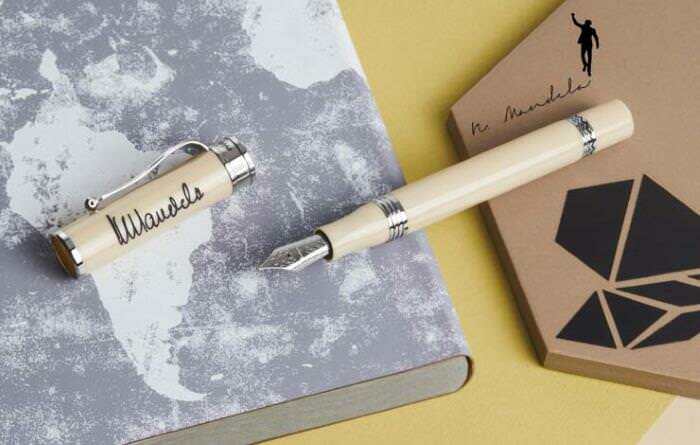 Mandela’s pens are further adorned on the clip by his victorious and most famous silhouette, as well as his original signature in enamel-filled engravings etched on the pen’s cap. South Africa’s incredible folkloristic heritage is symbolically reported through the palladium - plated decorative ring at every pen’s barrel end. This signature collection was especially designed as a regular line, available in a limitless number of items, as we would like to invite all people willing to pay their tribute to one of the greatest humanitarian legends of the 20th century, to do so. The Nelson Mandela writing instruments collection makes part of our “Mightier than the Sword” icons series.